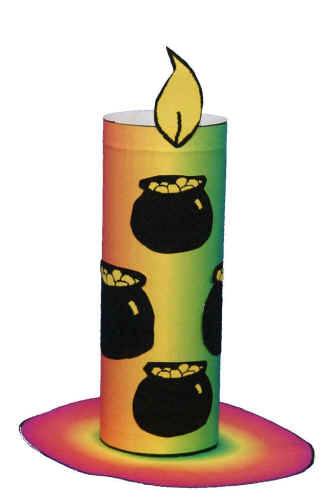 This tp roll candle is nice and colourful and quite easy to make. Make enough of them and you may even attract a Leprechaun or two! Glue the rectangular piece onto the tp roll. Glue the flame onto the top of the tp roll to make the candle. Tape the candle to the circle ("doily"). Glue on the pots of gold to decorate the candle or doily as desired. Use sparkles, sparkle glue, or felt to decorate the "candle". Use water colour paints with the black and white printer template to get a rainbow effect.